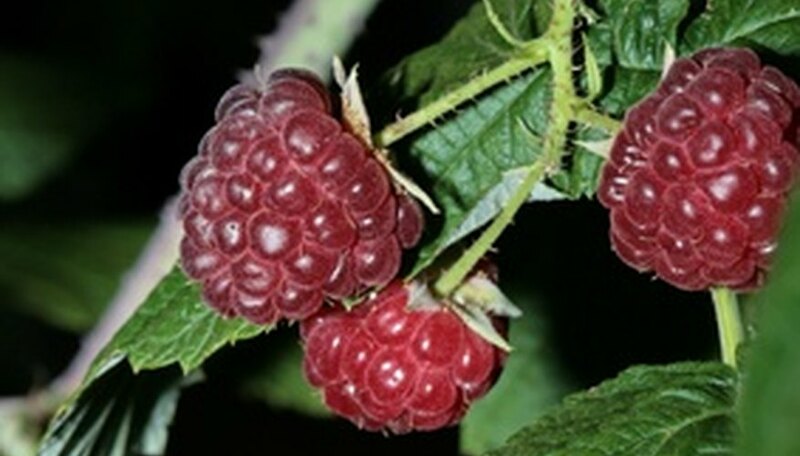 Raspberry bushes can grow quickly and efficiently, spreading over the ground or upward. Either way, the brambles must trellised in order to grow correctly and in an aesthetically pleasing way. Building a trellis for raspberry plants can provide more air circulation, help make pruning easier and also provide a maximum yield of fruit if cared for in a proper manner. Use a mallet to insert a 6-foot post about 12 inches into the ground at both ends of your raspberry rows, or on either side of a plant. Keep the posts about 1 foot from the base of each plant. Use the 2-by-4 boards to create two crossbars. Use the hammer and nails to secure one crossbar to each wooden trellis post two feet off the ground and the near the top. Wrap the wire around the end of the bottom crossbar, stretching it to the one on the opposite post. Repeat this procedure from the end of each crossbar, so there is a total of four wires running across the raspberry plants. Wear the garden gloves to handle the raspberry brambles to avoid any thorns. Carefully separate the canes and wrap them around the wooden posts and thread in and out of the wires, working outward away from the main trunk. Once the canes are separated and wrapped in and out of the wires, it will make pruning easier because you can identify the broken, dead or diseased canes, as well as cut back what canes appear weaker. It will also have a more beautiful appearance. Tighten the wires about once a year to ensure the weight of the raspberry plants will be supported.